NZ Here we come ! presidential Blue House that day . lifelike , set in their appropriate backgrounds . That day was really exhausting , as we didn't go to bed at all , the night before . We only snatched what sleep we could on our 6 hour flight from KLIA M'sia to Seoul . The third day saw us on the go again . The schedule was fully packed everyday . 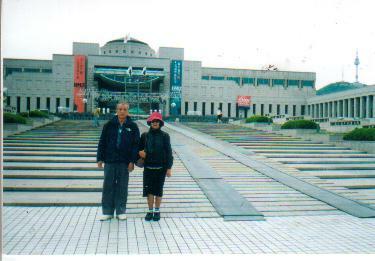 That day we visited Korea Floritopia 2002 , a grand Exhibition of Flowers . could buy all sorts of souvinirs and tasted all sort of foodstuff and drinks . visitors to sit and rest ; lots of toilets when nature calls. that were very exciting . turns North Korea and South Korea into two seperate countries. We saw the tunnels , ten of them , dug by the North Koreans to attack South Koreans . Another attraction of this trip is to be able to see the World Cup Soccer Stadium. key chains and so on. from pests and excessive heat . Almost all the lands are fully utilized . Amethyst Factory . Both of these commodities cost a fortune . Well , that's so much , I can remember about my Korean Trip. us with such detailed informations of his country .